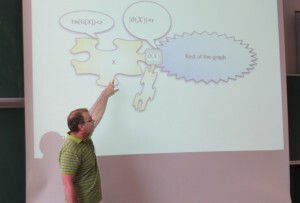 The Vienna Center for Logic and Algorithms hosted a talk by Fedor V. Fomin at WorKer 2011 – The Third Workshop on Kernelization. A protrusion in a graph is a subgraph of constant treewidth that can be separated from the graph by removing a constant number of vertices. We discuss combinatorial properties of graphs implying existence of large protrusions and give a number of algorithmic applications of protrusions.